SMOOTHEST CONTROL LINES IN THE INDUSTRY, ASK US TO PROVE IT! A revolution through innovation. Since inception, Vibration Research has been considered a pioneer and leader in the field of vibration control. The advantage is clear: Innovation. 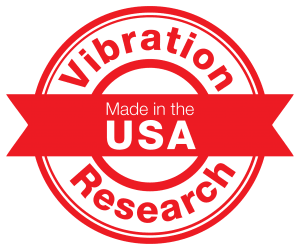 Vibration Research listens closely to your needs, and focuses on producing innovative and effective tools for testing laboratories. Please ask about a free demonstration unit with all software enabled! VibrationVIEW software is used to set up and monitor vibration tests, and automate customized reports. It is Windows compatible, running on all current versions of Microsoft Windows (back to Windows 7). Test modules are available à la carte, so each system can be configured to your specific requirements. A minimum of one test module is required to get started, and additional modules can be acquired at any time in the future. Test modules are also available to rent for short term needs, and are easily activated via electronic key. Vibration Research offers 2-day training seminars covering general vibration principles and software. These courses will help you become more efficient and knowledgeable in the vibration test world. Stay ahead of the competition with your ability to use advanced test software effectively and efficiently. Training is included for free with the purchase of a vibration control system! Don’t be left behind as technology advances! You can remain up-to-date with our lifetime hardware warranty, software developments, features, and enhancements as they are released. To receive software upgrades, unlimited technical support, lifetime hardware warranty and more, a current Upgrades & Support Agreement must be maintained.